Clover's NEW! Mini-wonder clips small size works well with miniature patchwork, doll clothes, and all work that requires holding pieces together in tight sections. Since their introduction primarily for seam binding on quilts, they have been adopted by crafters, beaders, scrapbookers, card makers and every craft where a third hand is needed to hold something down, together or in place. They make a great gift for any crafter or home sewer. What does it do? We are still counting!! We'll let you know when people stop finding new uses. 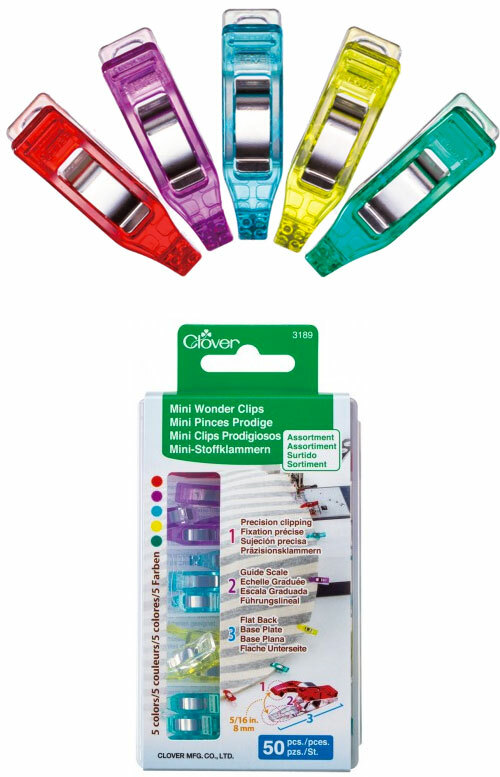 Sewing - Mini Wonder Clips are a natural for holding together layered sections of fabric during the sewing process. Quilt bindings, hems, piping, seams, etc., all can be held securely in place while sewing. Unlike pins, Wonder Clips do not leave holes in leather, delicate or vinyl/laminate type fabrics. You can easily position applique or hold patterns in place while marking or cutting and avoid puckering issues caused by using pins on some fabrics. Crafts and Beading - Mini Wonder Clips are like having a "third hand". They are strong enough to hold virtually any sewing, art, or general craft materials in position while you glue, sew, paint, tie, staple, embellish, dry, or carve . . . whatever is required to create your masterpiece.